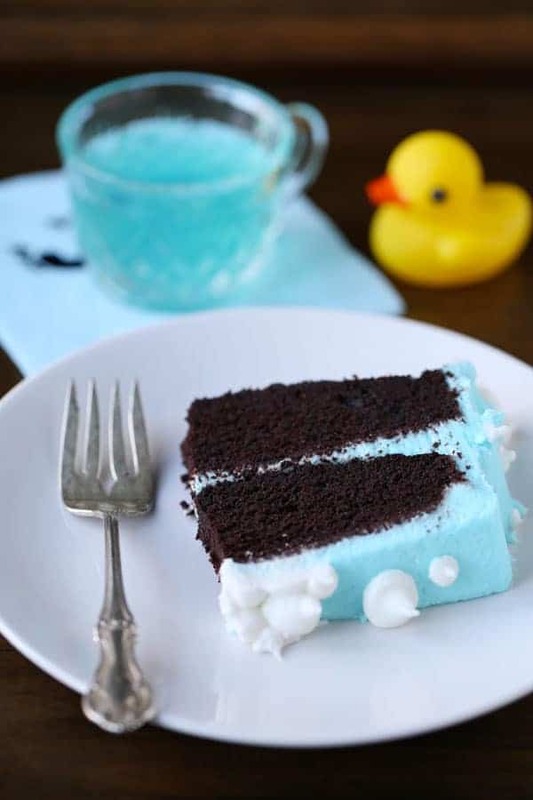 Rubber Ducky Baby Shower Cake is a moist chocolate cake with almond frosting, plus it’s gluten-free and dairy-free. I hosted a baby shower for my sister last weekend. She came all the way from California to attend the event. It was very special and I wanted to make her a cake that would be just as cute as it was delicious! 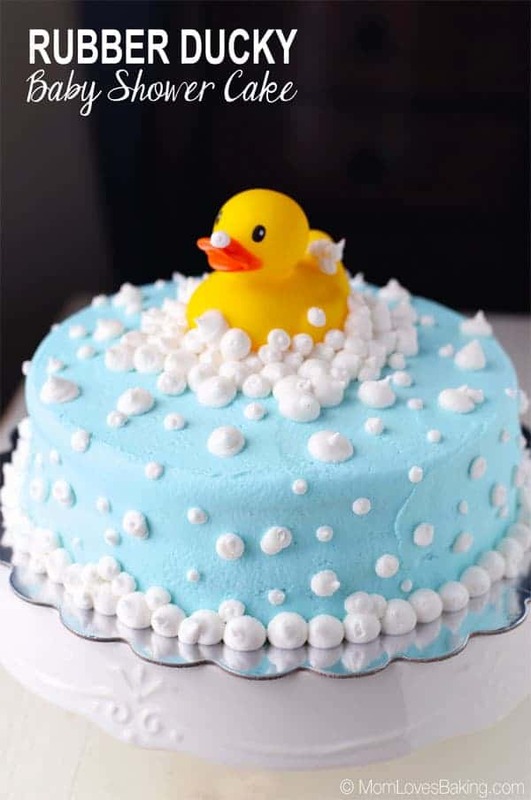 I had already decided to make rubber ducky punch, so I needed a cake to match. 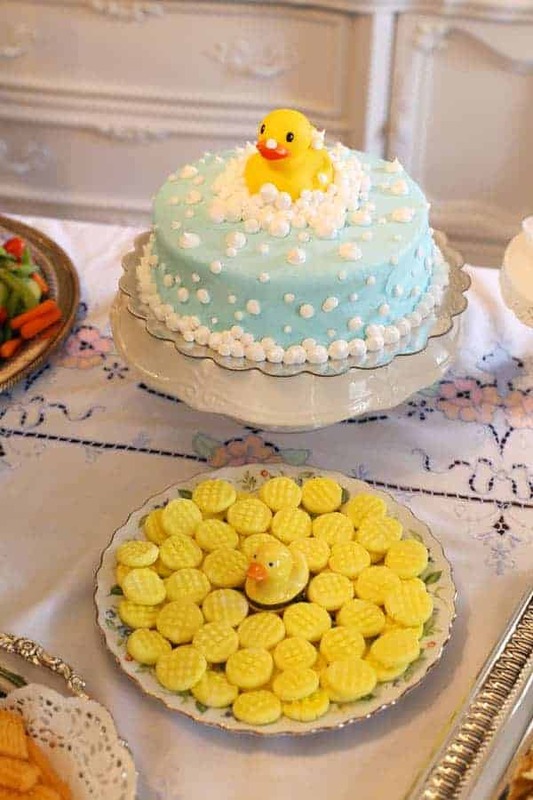 I found a picture of an adorable rubber ducky cake online and thought it was a super idea. Plus, it would be fairly simple to decorate. I also needed to make it gluten-free and dairy-free, so my daughter could eat it. I used a gluten-free chocolate cake mix and substituted vegetable oil instead of butter. I baked two 8-inch round layers. Then I whipped up a dairy-free frosting which consisted of vegetable shortening, powdered sugar and some almond flavoring. I colored some of the frosting light blue and frosted the cake with that. As you can see from the video (above), decorating the cake was quite easy with my two handy tools – an offset spatula and bench scraper (see below if you want to purchase these on Amazon), plus pastry bags and tips. I filled two pastry bags with the remaining white icing. One was fitted with a #4 round pastry tip and the other was fitted with a #6 round pastry tip. 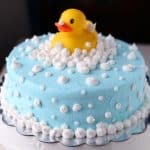 I placed a rubber ducky on top of the cake. Then I simply piped little round balls of icing to look like bubbles. I have to mention the cream cheese mints in the above photo. They were homemade by my aunt Emily. They were a wonderful addition to the table and so tasty too! She brought chicken salad from Chicken Salad Chick which was a big hit! If you’ve never had Chicken Salad Chick, you MUST try it! They have about 12 kinds to choose from! The cake came out great and it was scrumptious! Kathryn, the mom-to-be, approved! I’m so happy that she loved the cake and all the goodies we had at the party. We’re so excited to meet her baby boy, due to arrive on December 31st! 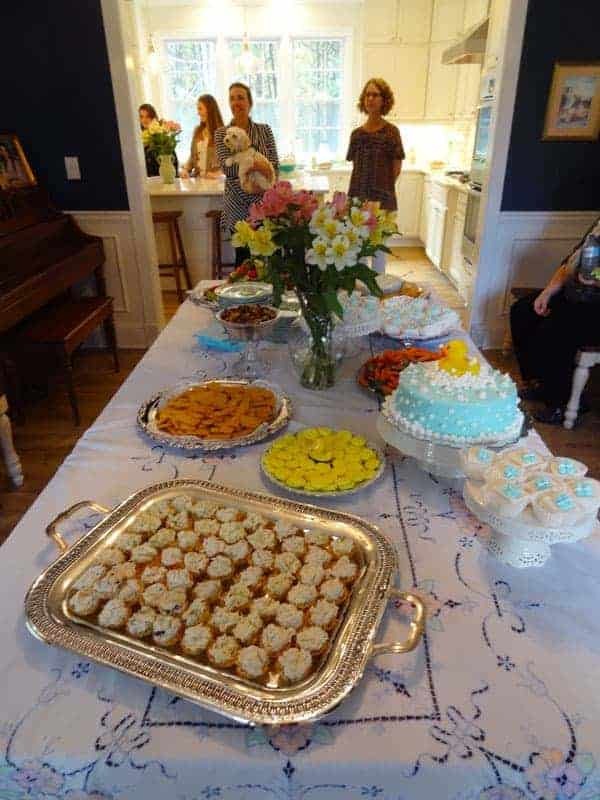 I wanted to throw a traditional, Southern baby shower, so I had a little help from my sweet Alabama relatives. Thank you to my aunt Sara for bringing the famous Rolen’s Bakery petit fours from Dothan, AL and thank you to my cousin Maggie for loaning me these beautiful silver serving platters. I lined a few of them with white doilies to be extra fancy. I used my grandmother’s table cloth which I actually got professionally pressed for the first time ever. It’s never looked so good! I used my grandmother’s china called Singapore Bird by Adams China. I wanted to have a paper plate free party, but didn’t have quite enough china for all the guests, so we ended up getting a few clear plastic plates for the young boys in attendance. – Homemade Cheese Straws made by me! A Southern favorite and I even used my grandmother’s cookie press which required a lot of elbow grease, but still was special and they came out great. 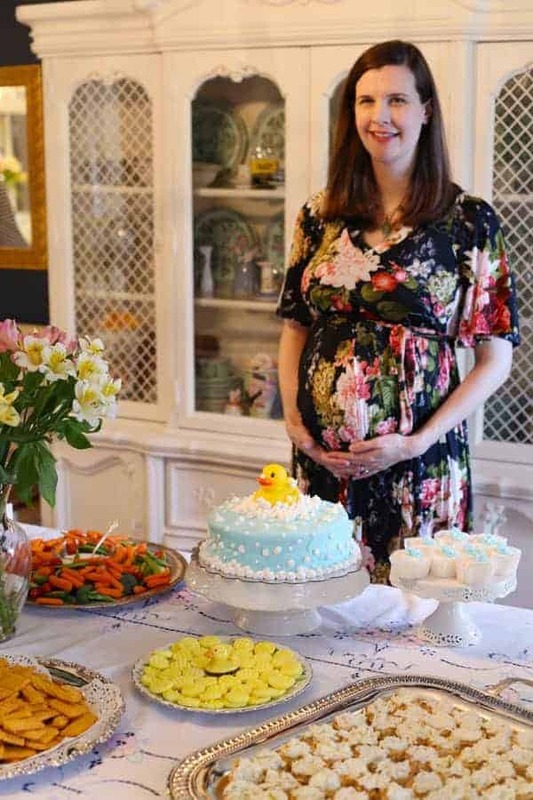 The baby shower was so much fun! 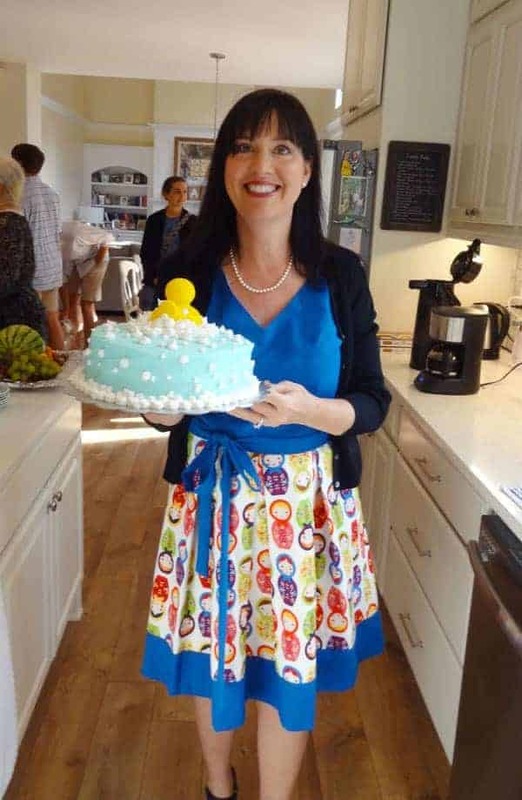 I just love getting together with family and friends while enjoying traditional treats and of course, this Rubber Ducky Baby Shower Cake! It was the first official party in our newly renovated kitchen which I’ll be blogging about soon. I can’t wait to show y’all the before and after pictures of our 3 month kitchen project. Stay tuned for that. p.s. Special thanks to my neighbor, Barbara, who made this fun, Russian doll dress. If you’re a fan of New Girl, you might recognize it. Spray two 8-inch round cake pans with cooking spray and line with parchment paper. Spray again with cooking spray. Set aside. Prepare 2 cake mixes according to package instructions (I used vegetable oil instead of butter). Pour into prepared pans. Bake for 35-40 minutes or until toothpick inserted in middle comes out clean. Cool. Beat shortening in large bowl with electric mixer on medium for 2 minutes. Gradually add sugar, almond milk and almond flavoring with mixer on low. Once combined, beat on medium for 2 minutes. If it's too thick, add 1-2 tablespoons more of almond milk. Take out 2 cups of white frosting and place in a small bowl. Color the remaining frosting light blue. I added one drop of blue food coloring. You can add a little more for a darker color. Frost the first layer of cake, then add the second layer and frost the entire cake smooth. See the video for further decorating instructions. Divide remaining white frosting into two pastry bags, one fitted with a #4 round pastry tip and another fitted with a #6 round pastry tip. 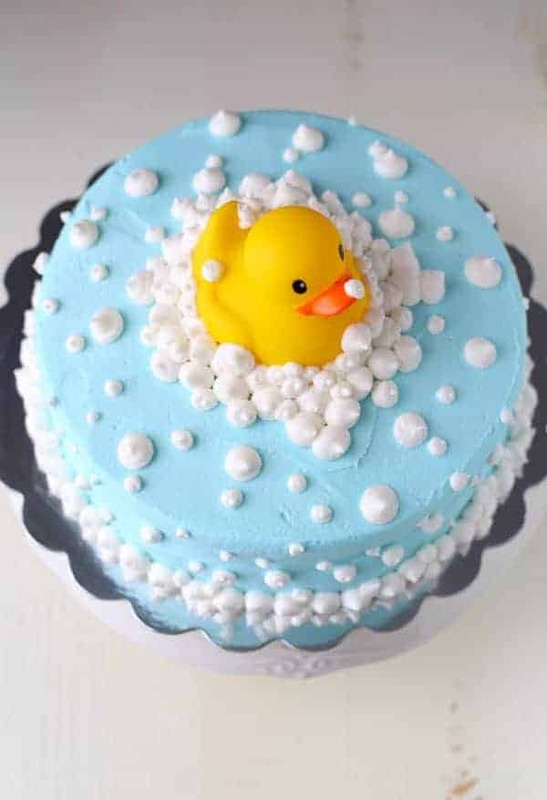 Place a clean rubber ducky on cake, then pipe small, medium and large "bubbles" on to cake in a pattern of choice. Serve. Store cake covered at room temperature for 2 days and in the refrigerator for up to 5 days.